Call me a cynic, but I doubt these dudes can even read a warning label. I wouldn't think of calling you a cynic as I am the biggest uber-cynic on the planet. My thought was that with all the time these 5 have spent in prison on the tax payer's dime they are all probably working on law degrees. I find it odd that they managed to get their documents filed in the US Circuit Court. Kiddo number two must have gotten his wit from you...too fun!!!! He may of gotten his wit from his mom but he got his good looks from his dad....oh and his height, too. 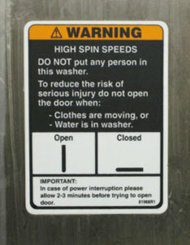 Speaking of warning labels...when I worked out at a health club there was an elliptical training machine with a warning label that said to keep hands and feet away from moving parts. I laughed every time I got on the machine. Who thinks up these things?? Now I want to know this: would he have started drinking if he knew he was stupid? Alcoholism has been around since way before they were born so it'll be hard to really put the blame on not having a warning label. As far as what to add to the label, Overuse of this product may cause Staggering with the intent to Crawl. As always, great post! I hadn' heard about this lawsuit but it is kind of funny. 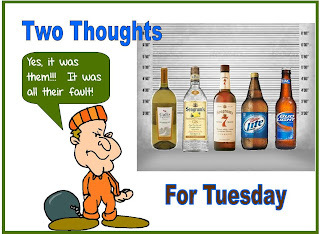 Maybe we should have beer companies play a list of possible side effects after their superbowl commercials! I can see it now, clidesdales marching through the snow - bringing memories of a crisp cold beer - followed by a picture of these guys and a list of possible side effect like ending up in jail for being a bad drunk. You are so right. People tend to think that warnings don't apply to them...especially the idiots. 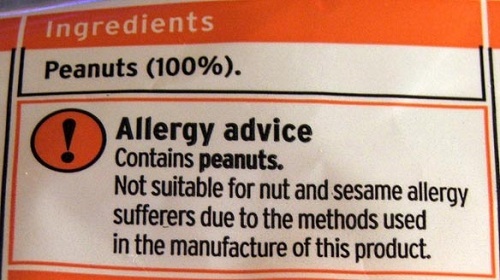 Susan, that is one of the funniest warning labels I have ever heard of. I actually do keep my feet off the moving parts of an elliptical trainer as much as I can but not for safety reasons...more for lazy reasons. If I were giving awards for comments...and I am seriously thinking of holding a contest...that is a winner. It is snort worthy!!!! 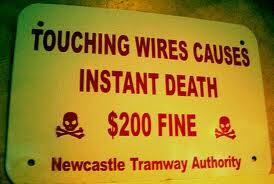 Love that $200.00 fine for touching the "Instant death" wire. I guess you need to have the cash on you when you touch the wire. They better turn off the juice before going through anyone's pockets. I have noticed that on those shields as well. You just know that someone did that once upon a time or there wouldn't be that warning. How obtuse can consumers be???? There was a statement issued by one of the lawyers out of Boise that said exactly that. He thought it was a given that people knew the effects of alcohol. 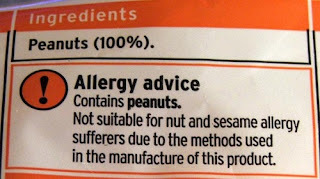 I guess that companies need to cover their asses though with a warning label so people like this can't claim ignorance. I love that "intent to crawl" Funny...and perfect. warnings and lawsuits - a sign that the end is near? I think a story I heard about a person suing a ladder company because there was no warning that placing the ladder in frozen manure (farming accident) was dangerous is true. You probably have heard the parody of drug ads called Tequila. The side effects listed at the end are hilarious. Yes, they could do what the pharmaceutical companies do....talk really, really fast at the end of the commercial with all the possible side effects. Instead of asking them to call their doctor, it could advise them to call their sponsor. That one took the prize for thinking "outside the box". How many people say "Damn, I can't touch it because I only have $50 on me." I hadn't ever seen that You Tube video but that is hysterical. Had I known of it's existence I would of added it to the post. I'm glad I dropped off the link. I almost didn't since the clip has been around for awhile. After I found it again, I thought hell it's so funny it's worth listening to again. Our world has changed dramatically in our life time, hasn't it Michele. There weren't warning labels on much of anything back in the 50's was there? I guess we wouldn't of known as we would have been little kids but now every piece of clothing, every medication, every...everything has a warning....including how to cross a street. We also need these labels to remind us that alcoholism is a disease, and it's completely genetic, because it can be handed down to our children through our own blood supply. It's just basic science, folks. Are you getting all serious on me?? You are right of course, there is a genetic component and it is a disease. I actually have a little background in the genetics of this. No I don't drink but my maiden name translates to Son of a Drunk. I am not kidding. Some of my ancestors lived up to the name. I dunno, I think the BILLION dollars is completely reasonable. Do you know how much it costs for Armani jumpsuits? My personal favourite warning is on Q-tip boxes. Do not insert swab into ear. I could be wrong but these guys look like they might not be into Armani as much as Army Surplus. Good one, Nicky. 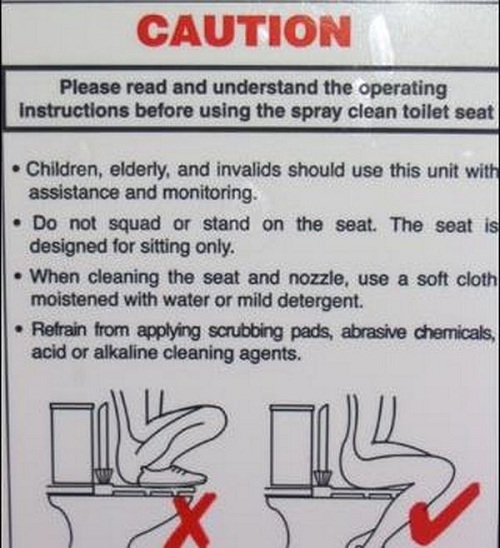 I have seen that warning too and yet I didn't think of it. Now why didn't I think about multitasking yoga with bathroom breaks? I could of had a much more toned body without ever going to the gym. I think you should be my life coach. 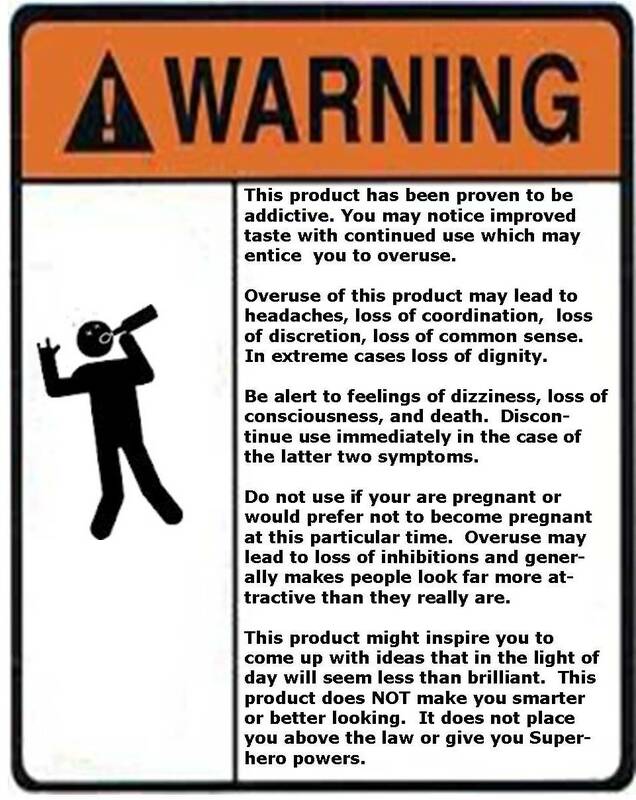 The five bozos with the lawsuit probably won't get their billion dollars but I won't be surprised if we don't start seeing warning labels covering the possible side-effects of alcohol on containers.